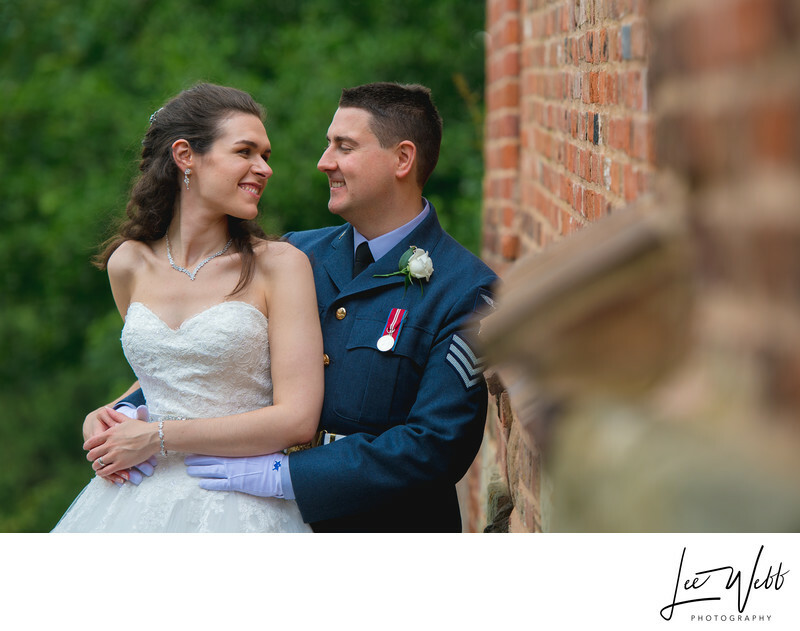 Beccy and Karl got married at St Georges church in Worcester, and held their wedding reception at Worcester Guildhall. In a consultation with the bride and groom before the big day, we decided that we'd build some extra time into the wedding day in order to have some photographs taken in the grounds of Worcester Cathedral. We made the arrangements with the cathedral beforehand, so we knew that we'd have no issues on the day. Most of the wedding guests went straight from the church to the Guildhall, with the immediate family and bride and groom heading to the cathedral with me. I took the formal group photos on the cathedral steps, showing the majestic cathedral off as much as I could. 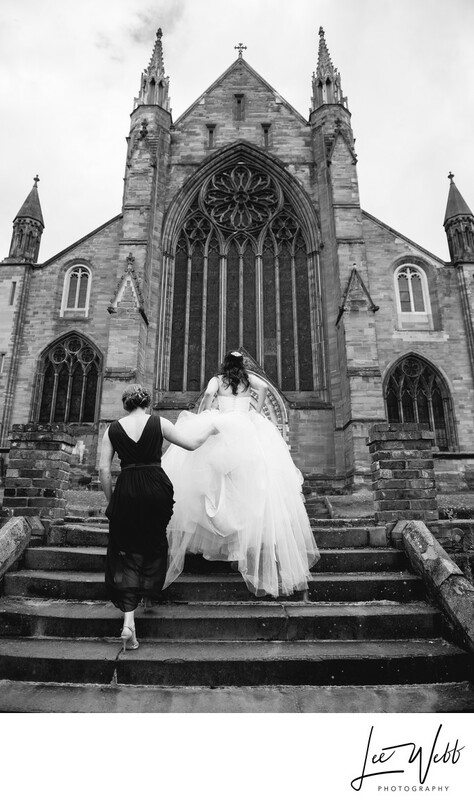 For the main image of this article, I found a stretch of original cathedral wall that I had the groom lean on, and then placed the bride in his arms. I made sure to shoot the picture from a distance, using a long lens to focus in on Beccy and Karl. Using a longer lens means that I was able to cut out most of the background, honing in on the affection shown between the couple. I included the wall as much as I could, using it to guide the viewer's eyes towards the couple, as well as adding a splash of rustic red colour to the image. I especially like how the red brickwork contrasts with the blue of Karl's RAF uniform. An image from the same location was used at the front cover for Beccy and Karl's wedding album as you can see below. 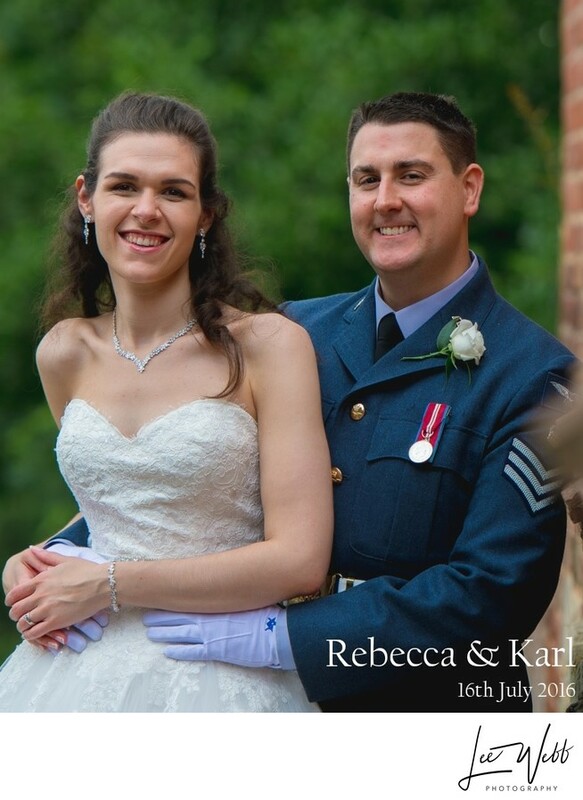 If you'd like to have a look at Beccy and Karl's wedding album design, please click here.